» COLLECTING PULPS: A MEMOIR, Part Five: Remembering MIKE AVALLONE. COLLECTING PULPS: A MEMOIR, Part Five: Remembering MIKE AVALLONE. While commenting on “Fifty Funny Felonies” by David Vineyard this past week, several readers started to talk about Mike Avallone. Sometimes the comments take over the original subject and go off in a different direction. I started to think about my friendship with Mike and how he was such a larger than life person. Is he really gone? Here are some of my memories. Stephen Mertz mentions how Mike would start talking and telling jokes “full tilt,” and how his wife Fran would yell at him to shut up and listen, but Mike would carry on. There was no stopping him. In 1995 Mike was Guest of Honor at the Pulpcon convention along with Hugh Cave. Everett Kinstler, the famous portrait painter and Shadow illustrator, also was a guest but to tell you the truth I was so busy buying and selling pulps that I don’t even remember Kinstler being there. But I sure remember Mike Avallone. Mike was so excited and hyper at this convention that he was practically out of control. Why? Because he took being Guest of Honor seriously and was so pleased at the recognition from his friends and fellow collectors. He received a beautiful plaque showing four pulps and digests that he had appeared in with stories. Mike did actually have a few tales in the pulps before they disappeared. The entire four day weekend, I don’t think Mike got much sleep. Every night he was up telling jokes, talking about movies and baseball, interacting with the other collectors. One of my close friends, Harry Noble who was one of the great pulp collectors, had a habit of going to bed early at 9:00 pm and getting up at 3:00 am. He got up as usual at 3:00, saw Mike and a several collectors sitting around laughing and talking, and thought we were all getting up early like him. The truth was that we had not even gone to bed yet. Some people did not take to Mike at all. He seemed to have the ability to annoy or make some collectors angry. I was witness to this at the Bouchercon in Philadelphia in 1989. Again Mike was over the top and greeted a fellow collector’s wife and grown daughter with hugs and smiles. But they were really uptight and dignified and acted horrified at his friendly behavior. It was comical to see the collector’s embarrassment as his wife and daughter backed away from Mike with big frowns. On the other hand, my wife and daughter loved Mike and his funny compliments. When it was time to eat dinner, we made the mistake of going into Bookbinders restaurant, which was too classy for people like us. We sat down with the help of several waiters, saw the menu and prices, and immediately realized we had blundered. I was prepared to stay and pay the high price of the meal rather than leave, but not Mike. He stood up and led us out past the disapproving gaze of the waiters and other diners. I felt like a fool lugging my two sack of books but Mike just laughed as usual, and we ate at a nearby pub. Many times Mike visited my house with other collectors and often stayed for dinner. He liked my wife’s Italian cooking. But he liked my pulp and paperback collection even more. 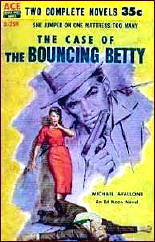 I happened to have the original cover painting to the Ace novel by Mike titled The Case of the Bouncing Betty. He loved looking at the painting and gave me a photo of the painting that he owned to The Tall Dolores, another Ed Noon novel. I tried many times to buy the painting from him and though I had the impression that he needed money, he just couldn’t sell it. 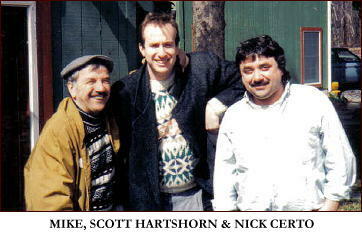 For many years Al Tonik held meetings at his house which we called Tonikcons. There were around 20 or these, most of which Mike attended. We would eat and drink, meanwhile talking books and pulps. One meeting he bought a video tape showing when he was a guest on the TV show To Tell the Truth. I believe he appeared in 1981. When he would visit me he often headed to my paperback room which had a couple of stacks of Avallone paperbacks. The first couple times he pulled out his pen and offered to sign them all. But every time I said “no, don’t sign, they are worth more without the signature.” Many authors would have been angry at such a joke, but not Mike. He said that would be the way he would want to die if he had to go. Mike said he wrote a short story about almost falling down the stairs, but I’ve never seen it. But the thing he liked even more than the paperbacks, was my Spider pulp collection. He said it was his favorite magazine as a boy and he loved looking at the issues. In the late nineties he sold his house in New Brunswick, NJ and he moved to the west coast. His friends back east worried about him not having his support system of pals, and I guess we were right. He died soon after moving within a year or two in 1999. Soon after his death I sold my Spider set, and so ended a period of my life that I’ve still not come to terms with. A Partial Bibliography. This list of titles that follows, taken from the Revised Crime Fiction IV, by Allen J. Hubin, consists only of Mike Avallone’s mystery and detective fiction published under his own name. It does not include crime fiction written under the pseudonyms Priscilla Dalton, Mark Dane, Jean-Anne de Pre, Dora Highland, Steve Michaels, Dorothea Nile, Edwina Noone & Sidney Stuart, not does it attempt to list any of his non-criminous work. AVALLONE, MICHAEL (Angelo, Jr.) 1924-1999. Previously on Mystery*File: Part Four — Collecting Detective Story Magazine. Coming next: Part Six — Collecting the other Popular Publications pulps. Editorial Comments: Thanks to Scott Hartshorn for providing the two photos you see above. The first was taken outside Nick Certo’s house, circa 1992. 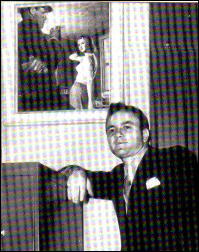 The black and white photo, taken in the early 50s, is that of Mike standing beside the cover painting for The Tall Dolores. The cover itself you can see in color just above the photo and to the left. Note that Mike can be seen in the cover of The X-Rated Corpse. He’s the fellow on the right. Coming tomorrow: Bill Pronzini’s 1001 Midnights review of The Case of the Violent Virgin. The only time I ever met Mike in person was the Bouchercon in Philadelphia in 1989. He was unique. In 1989 Mike Avallone was nominated for Best Paperback Original: HIGH NOON AT MIDNIGHT. He didn’t win but he had a ball at the convention. Fine post, Walker. I never met Mike but corresponded with him for many years. It’s nice to see him remembered this way. I bumped HIGH NOON AT MIDNIGHT off the list of FIFTY FUNNY FELONIES at the last minute, but probably shouldn’t have. It’s a surrealist masterpiece of film plots and references, Avallone’s unique style of expression, and gifted storytelling. It belongs on that small shelf of unique books in the genre, one of a kinds — like its author. And its nice to know he got some of the attention and recognition he deserved even if it came at a time when his fortunes were at a low point. Irrepressible was the impression he gave in his fiction and the articles he wrote, and seems from all the stories to have been his nature. In a way it is comforting to know that the man behind those books was a genuine as they seemed to be. A great many pulp and paperback writers ended their careers as he did, but at least, if not monetary reward, he got some of the love and respect he deserved from fans — most of them anyway. Just a question, but did he write enough about the pulps and the genre in general to collect? I’ve read quite a few articles by him in various place, and if there were enough a collection of them would be a treat. The list reminds me that the first Ed Noon I read was 1969’s THE DOOMSDAY BAG, which I reread a couple of years ago. I’m pleased to say it still holds up well, perhaps a bit more straight forward than most of the Noon novels, but a solid read with a memorable finish. It wasn’t my first Avallone by a long shot (that was RUN SPY RUN with Valerie Moolman in the Nick Carter series, but I didn’t know it was Avallone at the time), but my first Ed Noon and made a lifelong fan of me. James: Thanks for your support. Over the years I’ve heard too many people criticize Mike and I just felt it was time to say that the Mike Avallone I knew had many good qualities. And his letters were one of a kind! Some had drawings and jokes written in different color ink. I’ve never seen such letters from anyone, ever. Near the end of his life he was complaining how not many of his friends responded or answered his letters. Of course he was an early victim of the email revolution. Now everything is just about email or texting. The art of correspondence is dead. We soon won’t see anymore big collections of letters from artists, writers, etc. The first time I met Mike was at Andy Biegel’s home. I think it was around 1976 or 1977. To be honest he irritated the hell out of me at first, but as time went on something strange happened (which is rare for me as first impressions seem to stick with me) I found myself being charmed by his enthusiasm and looked forward to seeing him at Pulpcon every year. I find myself thinking of Mike from time to time and really missing him. David, HIGH NOON AT MIDNIGHT is an example of the Ed Noon series at its craziest. Mike could be hilarious when he got going telling jokes and quoting lines from the old movies. I’ve never met someone who remembered so many great scenes from movie after movie. In fact, if you were in a car or a room with Mike Avallone, it could get exhausting because he had so much energy and love of life. He wouldn’t shut up! Like his wife Fran said when he was talking to Stephen Mertz, “Mike shut up and listen!” He was like a character out of his novels, in fact Ed Noon IS Mike Avallone. He really did not write enough about the pulps to publish a collection of his articles. He loved them and read them as a boy, in fact the SPIDER was his favorite. He started writing for them just as the pulps era ended. For instance his Guest of Honor award showed two sport pulps that he had written baseball stories, in fact baseball was one of his loves. He did write an article in MIKE SHAYNE MYSTERY MAGAZINE in the 1970’s which was a love letter to the SPIDER pulp. You mention that your impression of him was “irrepressible”. That’s a good word to use in describing Mike Avallone. Barry: Some other readers and collectors have mentioned that at first they were irritated by Mike. But if you gave him a chance before you knew it, you were an admirer and fan. He was so enthusiastic that at first he was just too much to put up with. But then as you and I, and others found out, he was a great guy with alot to say about books, movies and baseball. Upon first meeing my wife, they became friends, and since they both loved movies, Mike offered to arrange a meeting with one of her favorites, Gene Kelly. It seems Gene Kelly and Mike were great friends and when you think of it Kelly had a love of life that came across on the movie screen, just like Mike’s enthusiasm. And Mike really enjoyed those meetings at Andy Biegel’s home. He was crushed when Andy died. I saw Mike lose it another time while at the NYC Paperback convention. We were talking when all of a sudden someone said that Robert Bloch had just died. Mike was so depressed that he got real quiet and kept saying that he couldn’t believe Bloch was dead. Despite what some have said, there were some writers that Mike loved. Beautiful piece, Walker. It’s good to see a side of Avallone not talked about much. Mike could turn on you in a heartbeat (and did, to me) but before he got enraged he was fun to talk to. I have many wonderful memories of Mike when he visited us in the 80s and 90s in Jersey and I was just a teenager. He used to tell me I looked like Debra Winger and gave me the soundtrack to “Anchors Aweigh”, autographed by Gene Kelly. He was always so sweet, funny, very kind and generous. I hate that he left us too soon. I still think of him and miss him to this day. Peter Enfantino and John Scoleri have a great site where they talk about old magazines such as MANHUNT and the other mystery digests, not to mention EC comics and the SF magazines. Peter has an excellent post where he talks about the digest that Mike Avallone edited in 1957. TALES OF THE FRIGHTENED lasted two issues and Peter discusses each story, including several by Mike. As Christie mentions, Mike Avallone had the knack of complimenting girls and women and often comparing them to movie stars. He was constantly saying my wife looked like Marlene Dietrich and she never could break him of the habit. What a kidder! By the way, while writing these comments I checked through some of Mike’s Ed Noon paperbacks, and see that despite my telling him not to sign them, he must have doubled back one day because he signed my copy of THE X-RATED CORPSE. Dated August 1, 1992 he states, “To Walker and his pulp heaven! Michael Avallone”. Yes, he was irrepressible and there was no stopping him. For some reason the idea that Mike Avallone collaborated with Valerie Moolman on the first two Nick Carter books seems to be cropping up a lot lately. Based on what Mike himself told me in letters and on conversations I had with George Engel, Lyle Kenyon Engel’s son, I’m pretty sure Mike wrote RUN SPY RUN and THE CHINA DOLL alone, and SAIGON, which was intended to be the third book in the series, was a collaboration only in the loosest sense of the word, because Lyle Engel fired Mike when the manuscript was only partially completed and Valerie Moolman, who worked as an editor for Engel, finished it. Since the book didn’t come out until after several others that Moolman wrote solo, it’s possible that Engel didn’t give her Avallone’s partial manuscript to complete until then. I’ll pass this information on to Al Hubin, James. Thanks! I’m sure you’re right. Your chronology and what you were told was going on certainly makes a lot of sense. If I may ask another question, Mike always claimed that he created most of the background for the character. Do you have any idea of how much he did versus how much Lyle Kenyon Engel came up with? Lyle claimed in an interview that he created the character and also that he heavily rewrote a lot of the manuscripts in the Nick Carter series. That’s possible, but I have my doubts. By the time I wrote for Lyle’s company, he was ill and had little to do with the running of it. My impression from talking to his son George was that in the past Lyle’s main contribution to the series he packaged was coming up with the basic ideas. In this case, with the Nick Carter name in the public domain, he may have decided to use the name on a secret agent series to cash in on the popularity of the James Bond novels and movies and sold Award Books on the idea. But reading RUN, SPY, RUN, it certainly reads like mostly Avallone’s work. I’m confident that having the character give names to his weapons — Hugo, Wilhemina, and Pierre, iirc — was Mike’s idea since the pulp character The Avenger did the same thing with his gun and knife known as Mike and Ike. It’s a shame there’s no way to be sure about most of this stuff. I do know how much the authors earned for those early Nick Carter novels, though: a $500 flat fee per book. A penny a word, just like the pulp days. I only mentioned Moolman because of the listing in Hubin, which is where I got the idea. Certainly the books read like Avallone, but then his style was likely to dominate anything he penned. Re the naming of the weapons, I suspect it came from the same source the Avenger books took it from — Leslie Charteris the Saint. Whether or not it was original with him I don’t know. And of course, let us not forget Mike Hammer’s Betsy. Of course as said there is no way to be sure, and its likely more than one source contributed to the idea, but I do agree it sounds like Avallone. I had forgotten about the Saint naming his knives! It’s been too long since I’ve read any of those books. I’ll bet you’re right. I don’t recall Mike ever saying anything about reading the Saint books, but it wouldn’t surprise me at all if he did, given their popularity during the Thirties and Forties when he was a kid. Mike was one of those people you never forget. I met him at one of the PulpCons in the 1970s, and we remained friends until his passing. His correspondence was always a delight. I remember walking into the dealer’s room at PulpCon and seeing this guy in the room who just seemed to attract everyone to him like a magnate. As far as he was from us, when someone said to me, “That’s Mike Avallone,” he heard it, and seeing I was a new face in the crowd made straight for us. That was my introduction to the man. I was shocked to hear of his passing. Thanks for the kind words about my father, Walker (and others). It’s always interesting to read people’s memories of my father and his larger-than-life personality. In fact, my parents moved to Los Angeles in the spring of 1995. He was very happy out here, and having a great time… until he developed the pernicious variety of anemia that killed him, slowly and sadly. This was a blood disease: not the kind of thing you come down with because you miss your pals. Further, his wife and children were not in any way an inadequate support system for him. We were a very close family, and the move to California was the realization of a long-held dream for him. It didn’t make him unhappy, and it didn’t kill him. Sorry for the sour persimmons; I guess if there’s one thing I picked up from the old man it’s the irritating inability to let something go when I think it’s unfair. That aside, I’ve enjoyed reading this thread; it’s become all too popular to bash him, and it’s nice to see the positives being remembered, too. Hi David: Thanks for commenting about your father. Sorry if I got the detail wrong about Mike’s move to the West Coast, etc. But to his friends out here on the East Coast, Mike’s move was a major disruption and a sad event. Why? Because for many years he always attended our meetings at Tonikon and at my house, attended Pulpcon several times, and was part of our pulp and book breakfast group which used to meet every few weeks or so. In addition to me, the members of this group were long time pulp collectors such as Harry Noble, Scott Hartshorn, Nick Certo, and Digges La Touche. Mike really enjoyed himself at these meetings and held up his end depite the kidding and joking around. Mike was not one to act aloof or stand on his dignity, at least with us. That’s why I finally got tired of hearing some people complain about Mike and I felt I had show the friendly, enthusiastic side of Mike’s personality. He was always a great friend to me and I miss him terribly.